It’s been said that “dragon paths of energy” run close to the surface of the earth in Atlin, and that this energy will one day will attract aliens. One resident even proposed building a landing strip on top of Atlin Mountain, for visiting space craft. But lethargy, not energy, strikes first upon arrival here. On the dusty main street furry huskies doze in the summer sun; one of them sprawls on the roof of an apparently-abandoned pickup truck. Horses graze belly deep among flamboyant fireweed on a vacant lot that, like the entire town, overlooks the depthless, turquoise waters of Atlin Lake. A white sailboat moves lazily in the gentle breeze. And while no aliens have appeared in Atlin, perhaps the “dragon paths” help explain this Western Canadian town’s artistic energy. Anyone who arrives here — alien or otherwise — experiences an idealistic view of earth in this picture-perfect historic little town, 50 kilometers south of the British Columbia-Yukon border, on the eastern shores of Atlin Lake. For much of each summer, the sailboat and the occasional clanging horse bell are the only things countering the eerie feeling that this is an enchanted ghost town. The air smells of spruce and blossoms, with a crisp, underlying tang of lake. The hands of the town clock outside the post office stand forever at 2:30. Icelandic poppies of yellow, orange, pink and red grow around, under and through the wooden boardwalks. Buildings appear to have happened by accident, their silvery timbered cores supporting assorted additions. And after scores of years some original structures have retired from the unequal battle with gravity, and are sinking alongside their Johnny-come-latelys into ground sprouting fireweed, willow bushes and tundra roses. But interspersed with these gold rush relics are trim little cabins, their doors and windows outlined in white to show off bright blue or yellow walls. And, set back from Second Street, are newer buildings of straight, yellow logs, many flanked by flourishing vegetable gardens. Small boats nose into a battered dock, while and south of town a cluster of floatplanes huddles near the shore. Despite usual Atlin’s sunny-afternoon somnolence and air of benign neglect, the town’s 450 residents are loyal to this isolated, unworldly place. Named for the Tlingit language word Áa Tlein, meaning “big body of water,” the town is as far north as you can go in British Columbia. It’s surrounded by mountains on the west, south and east, and accessible only by float plane or one road leading north to Whitehorse, capital of the Yukon, 180 kilometres or a 2 1/2- hour drive away. This winding, scenic road, which joins the Alaska Highway 80 kilometer south of Whitehorse at Jakes Corner, sidles up mountains, curves along the lakeshore and rattles over deep, swift creeks. Motorists share this highway, which is typical of Canada’s north, with unhurried porcupines, suicidal ground squirrels and the occasional moose or horse. And each July, Atlin’s population swells to some 2,500, as music fans arrive for the Atlin Arts And Music Festival. 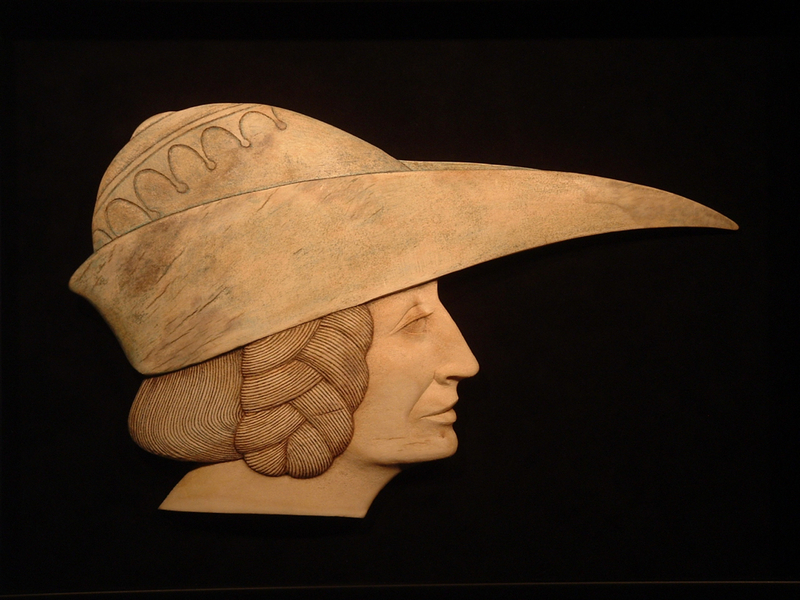 For Morris, Atlin is more than a peaceful place to work: it has a plentiful supply of the unusual material from which she carves elegant swans, plump owls, small birds and leaping fish. When she first came, “I saw all these antlers in people’s gardens. A dog had chewed the tips from one, so I asked if I could have it. 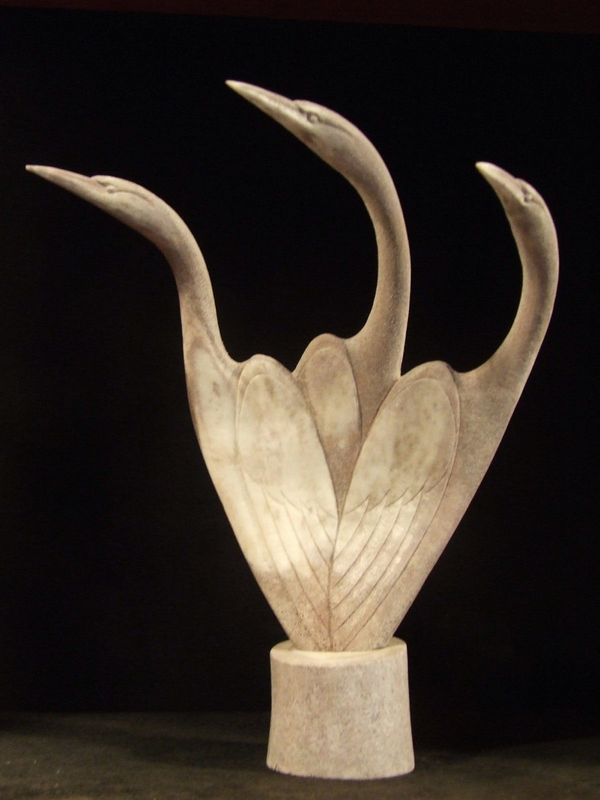 I started carving it, and that was that.” Moose, caribou and deer antlers, sheep horns, British Columbia jade and rose quartz are all grist for Morris’s grinding wheel, a legacy from her brief career carving jade into animal forms for a Vancouver company. Some of her birds are tiny, only a few centimeters high, others are tall and stately. Antler owls gaze unblinkingly, fat jade birds seem to snooze. Slender fish on small bone stands seem about to slip into water, falcons are poised for pounding and elegant swans are caught in flight. 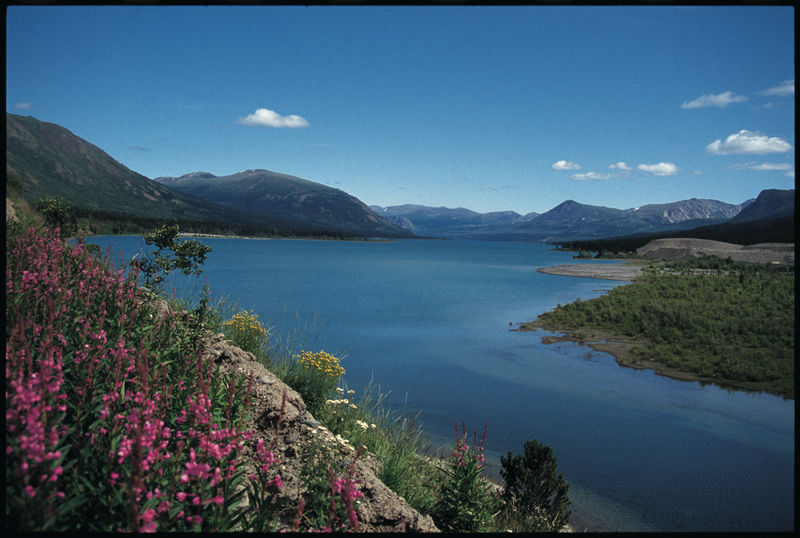 Atlin Lake is the economic and recreational mainstay for many residents. Conventional jobs in town are few: most people create their own. Many guide fishing, photographic and camping trips, canoeing the same lake on which they train their sled dogs in winter. Dog-sledding trips entice visitors to town in winter and Atlin sled-dog racing teams rank among the world’s best. On Atlin’s snowy streets, dog teams have the right-of-way over vehicles and pedestrians. The lakes’ glacial waters are dangerously cold year round, but Warm Springs, 25 kilometers south of town, draws bathers. A bonus to taking a dip in the mineral-rich waters is the peppery watercress that grows around the spring’s natural pool. Physically and psychologically, Atlin is far from anywhere. Its artists and mountain climbers, sailors and writers, guides and dog mushers, pilots and gold miners have come from elsewhere to live wisely, if not always wealthily, in this tiny town. Here fact and fantasy indulge each other, united by the contrasts that are Atlin. A cedar-shake pyramid, home of the Atlin Holistic Society, faces a Victorian-era residence renovated by the Atlin Historical Society. 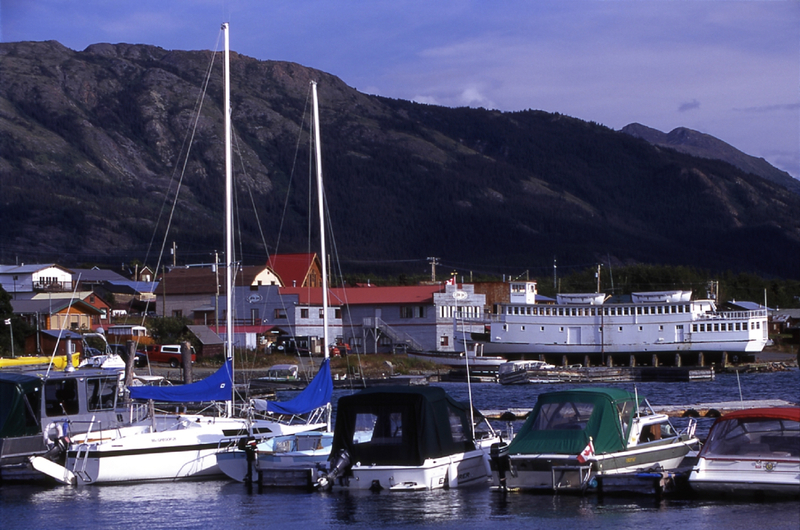 The icy waters of the lake are only a few miles from the perpetual warm springs, and in summer sailboats skim by the grounded lake steamer, Tarahane, built in 1916 and operated until 1936, carrying passengers and freight between Atlin and the portage community of Tagish in the Yukon. During the long, hot northern days of summer residents chop wood for the cold winters, and in the winter, they chop ice for freezer boxes. Fish grow slowly in the cold water (a fair-sized lake trout may be 30 years old) but vegetables flourish to award-winning proportions during three months of 24-hour daylight. Atlin: the Story of British Columbia’s Last Gold Rush. Dickinson, Christine Frances, and Diane Solie Smith (1995) Atlin Historical Society.